This event is presented alongside an online exhibition of Comp USA Live as part of the series First Look: New Art Online, copresented by Rhizome and the New Museum. Formed as part of the experimental online channel 8Ball TV, Comp USA Live’s creators describe it as “the original live desktop theater internet television show.” Streamed episodically on a website that resembles the desktop of a Windows2000 computer, the show features segments that include surly anti-comedy standup monologues, songs performed in CGI landscapes, sudden interruptions from oddly dressed members of the studio audience, and dramatic behind-the-scenes footage of infighting among the show’s makers. But Comp USA Live is more than just an unhinged remake of The Muppet Show —through the use of custom software and web interfaces, it aims to rewrite the underlying relationship between viewer, performer, and computer user. After concluding Season 1 with the launch of a highly dubious cryptocurrency, the Comp USA Live team will make a fresh start for Season 2 with this newly commissioned live performance at the New Museum and on the web. 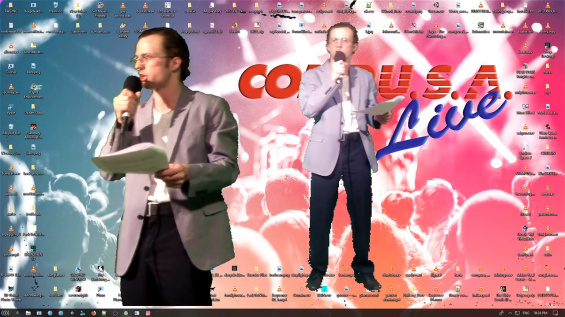 Comp USA Live was created by Mark Fingerhut, Tommi Kelly, and Michael Walker. The Comp USA Live team includes Collin Clarke, Tyler Geist, Brad Isnard, Brendan Kirk, Nicolas KK, Liliana Lacayo, Carly Lovejoy, Dennis Lynch, Gregory Nachmanovitch, Danny Orlowski, Maja Wittrup, and Detective Work. Comp USA Live and the New Museum will document this program through video recordings and photographs for use in future Comp USA Live productions and the digital archive of the New Museum. Comp USA Live received a grant as part of the 2019 Rhizome Commissions Program, which is supported by Jerome Foundation, the National Endowment for the Arts, the New York City Department of Cultural Affairs in partnership with the City Council, and the New York State Council on the Arts with the support of Governor Andrew M. Cuomo and the New York State Legislature.